I am tempted to say that this book has left me speechless, but that would be lying. In truth, I am torn between not knowing what to say and having so much to say that a proper beginning escapes me. In this novel, Yukio Mishima writes a fictional history for the 1950 torching of the Kinkakuji. Mizoguchi, the protagonist, is a disturbed Buddhist acolyte obsessed with the Golden Temple. Born with a speech defect, he considers himself ugly and cuts himself off from society. In his solitude, he is haunted by the temple’s beauty, unable to find peace until he destroys it. Faithful to Zen philosophy, Mizoguchi laments the disparity between his inner and outer selves: his incapacity to reconcile his thoughts with the world. Heightened by his inborn disability, this disjunction causes him endless suffering, since he knows that the gap which so torments him is bridged only by that elusive form: language. This tragedy of disconnection embeds itself even in Mizoguchi’s relationships. Tsurukawa, whose “bright heart…did not belong to this world,” is a rare exception: “Tsurukawa’s gentleness taught me that, even if stuttering were removed from my existence, I could still remain myself.” But apart from this one friend, Mizoguchi—because of his stuttering—fails to bond with others (the perverse Kashiwagi is a negative influence). Images like that of the dying Uiko fascinate him because they show human connection as opposed to his constant experience of disconnection. And it is this early image that haunts him throughout the book: for him, every girl is Uiko. Mizoguchi knows his own ugliness, but his twisted psyche finds one commonality between him and the Kinkakuji: temporality. Because of this, he finds perverse pleasure in the possibility of annihilation: “I was almost intoxicated with the thought that the fire which would destroy me would probably also destroy the Golden Temple.” So far removed from life (according to him the opposite of beauty), Mizoguchi seeks satisfaction in death and destruction with his final act, but there discovers only emptiness. The Temple of the Golden Pavilion is not the kind of book you’d pick up for an enjoyable read, but that does not detract from its achievement. It jolts the reader into a different consciousness through its disconcerting images and foreign aesthetics. Entirely absorbing and disturbing, it succeeds in its psychological portrayal of a madman driven to pyromania by his need for release. Because the fact of not being understood by other people had become my only real source of pride, I was never confronted by any impulse to express things and to make other understand something that I knew. In the distances I saw something white and indistinct. I thought it was the color of the dawn, but it was Uiko. In the village roofs whose dim outlines emerged in the darkness of the dawn, in the black trees, in the black summits of the Aobayama, yes, even in Uiko who now stood before me, there was a complete and terrible meaninglessness. As usual, it occurred to me that words were the only things that could possible save me from this situation. It was quite natural that wars and unrest, piles of corpses and copious blood, should enrich the beauty of the Golden Temple. What I dreamed of was something like a huge heavenly compressor that would bring down disasters, cataclysms and superhuman tragedies, that would crush beneath it all human beings, and all objects, irrespective of their ugliness or their beauty. When I am sad, sorrow attacks me suddenly and without reason: it is connected with no particular event and with no motive. What meaning could war have at this moment? At a certain place, at a certain time, it seemed to me that war had become a weird spiritual incident having no existence outside human consciousness. …if the world changed, I could not exist, and if I changed, the world could not exist. At the same time as looking, I must subject myself to being thoroughly looked at. I was trying to reach a destination, it did not matter where. The name of the place for which I was headed had not the slightest meaning. The law of distance that regulated my world had been destroyed. A stranger had fearlessly impinged on my existence. To my ears the rain seemed petrified with fear, as though it had wandered astray in this particular part of the town and had utterly lost its way. 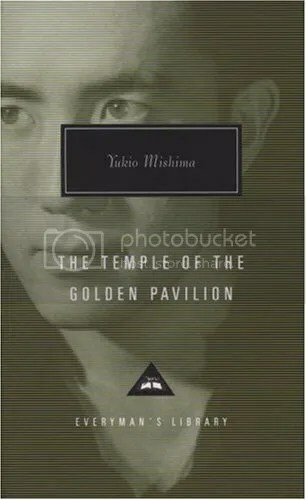 This entry was posted in Book, Novel and tagged The Temple of the Golden Pavilion, Yukio Mishima on January 27, 2011 by Michelle.